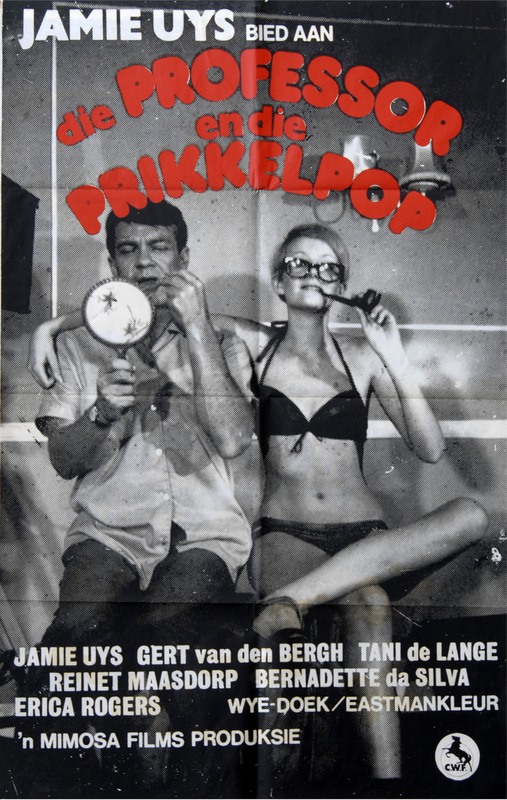 1967: The MIMOSA FILMS movie DIE PROFESSOR EN DIE PRIKKELPOP ("The Professor and the Beauty Queen") was produced by Boet Troskie in 1967, with Jamie Uys as director and scriptwriter. This was also Jamie Uys’ first movie for Mimosa Films. "Die Professor en die Prikkelpop" is the story of an absent-minded professor, Hans Botha (Jamie Uys), who gets involved as a judge in a beauty pageant, while at the same time his son is kidnapped. The viewer is drawn into the jealous infighting among the contestants, the long-suffering chaperone and the hapless professor, who does all the wrong things at the right time. Everybody tries to help, but just ends up causing more problems. The cast includes Bernadette da Silva, Genevieve Waite (South Africa’s answer to Britain’s “Twiggy”), Reinet Maasdorp, Gordon Mulholland, Carike Keuzenkamp (who sings the hit song “Timothy” in the movie), Erica Rodgers, Liezel Bosman and Tani de Lange, who makes her debut.